On 12 Dec 2015, the historic agreement to combat climate change was agreed by 195 nations in Paris at the COP 21 UN Climate Change Conference. 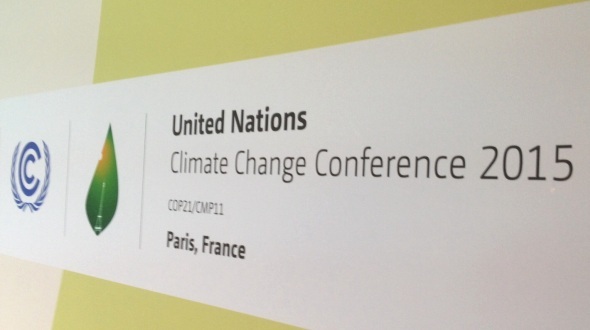 The laudable points of the Paris Agreement include the sharing of responsibility among all countries, developed and developing, to undertake and communicate ambitious efforts; the limiting of temperature increase to 1.5 °C, which is recommended by scientists; and the continuous improvement process, where countries submit new nationally determined contribution every 5 years that will be a progression beyond the previous contribution. However, there are no binding national targets for countries in the Agreement, which means each country will determine its contribution voluntarily, and hope that the combined global stocktake of actions would limit temperature to what is required. In addition, with the implementation of the current Intended Nationally Determined Contributions (INDCs) submitted by countries at COP 21, that would only limit temperature increase to 3.5 °C, much higher than the required 1.5 °C. There is still a large emissions gap between current efforts and what is required. There is a need to do more at a faster pace. What does the Paris Agreement mean for Singapore? 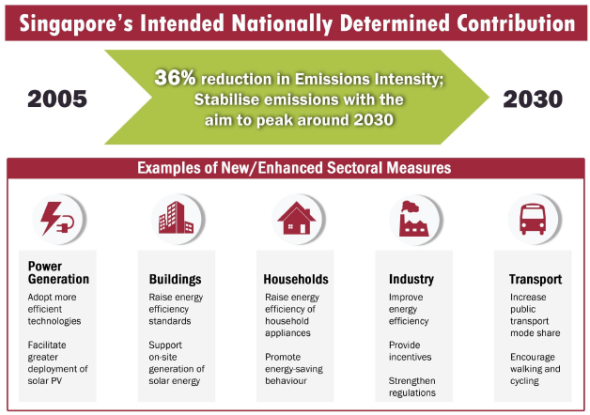 Singapore has submitted its INDC for COP 21, which states that it intends to reduce its Emissions Intensity by 36% from 2005 levels by 2030, and stabilise its emissions with the aim of peaking around 2030 (stabilise at around 65 MTCO2e). Singapore will also be reducing our emissions by 16% below 2020 business-as-usual (BAU) level, now that there is a legally binding global agreement (announced previously in 2009). The Paris Agreement mentions that there will be a facilitative dialogue among countries in 2018 to take stock of the collective efforts in relation to progress towards the long-term goal, and to inform the preparation of nationally determined contributions. Countries whose current INDC contains a time frame up to 2030 are requested to communicate or update by 2020 these contributions and to do so every five years thereafter. It is also clear that in order to hold the “increase in the global average temperature to well below 2 °C above pre-industrial levels and to pursue efforts to limit the temperature increase to 1.5 °C”, countries would have to “reach global peaking of greenhouse gas emissions as soon as possible”. Therefore, if Singapore ratifies the Paris Agreement and considering our government’s strict adherence to international agreements, the Agreement would bind Singapore to peaking emissions around 2030 (if we stick to the INDC target) and to do more to reduce our emissions (over every 5-year period). This is a strong and irreversible signal to companies and individuals in Singapore that we have to consider climate change efforts more seriously and lower our carbon footprint and be more energy efficient over the next few decades. 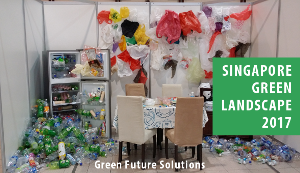 The government is preparing for the stabilisation of emissions around 2030, and is already adopting a multi-pronged approach to reduce Singapore’s greenhouse gas emissions across all sectors, including power generation and industries, buildings, transport, and households. The various efforts are well-documented in these reports: the National Climate Change Strategy 2012, Singapore’s Third National Communication and First Biennial Update, and the Sustainable Singapore Blueprint 2015. Although Singapore is currently on track and implementing the above mitigation measures, there is still potential to consider other measures and do more. Currently, the Energy Conservation Act mandates energy management practices for large energy users, and requires each company to submit its own projected energy reduction in the energy efficiency improvement plan under the Act. In the future, the government could make it mandatory for companies to commit to a minimum percentage reduction in energy consumption, especially for the refining and chemical industries, which are expected to contribute about half of Singapore’s 2020 BAU emissions. Power generation companies have to be more energy efficient and also look at demand-side energy management. The government can consider making it mandatory for power generation companies to implement energy efficiency and energy demand management programmes to offset a portion of the increase in customer electricity demand. The cost of implementing the programmes would be offset by the operational savings over time, thus ensuring that the costs would not be passed on to the customers. The government could also ban power generators from using coal. Tuas Power uses coal and biomass as fuel in its Tembusu Multi-Utilities Complex (TMUC) while using natural gas for its Tuas Power Station. According to Tuas Power’s Sustainability Report FY2013, the greenhouse gas emissions intensity for coal-fired TMUC is 488 gCO2/kWh for FY2013, which is about 18% higher than the 415 gCO2/kWh for gas-fired Tuas Power Station. Power generation companies that use coal have no place in Singapore. According to the Building Energy Efficiency R&D Roadmap initiated by the National Climate Change Secretariat (NCCS) and the National Research Foundation (NRF), buildings (including residential and non-residential) are responsible for around half of our electricity consumption in Singapore. The highest Energy Efficiency Index or electricity consumption per floor area per year is found in shopping malls and hotels. 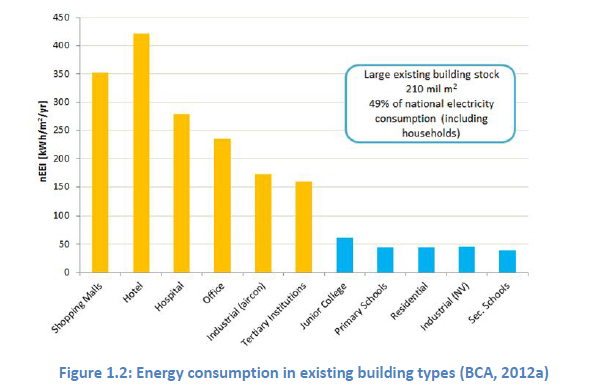 Typically, the majority of non-residential building electricity consumption is attributed to cooling (60%). There is a need to target energy efficiency efforts for shopping malls and hotels to improve their Energy Efficiency Index, and also to reduce the energy consumption used for cooling non-residential buildings. It is quite common to hear feedback about the problem of excessively cold air-conditioning in buildings in Singapore. The government could do more to ensure that building owners follow the recommended indoor temperature range of 23 to 25 °C, study how buildings with central air-conditioning can better control the HVAC system and optimise air distribution, and look into behaviour change and incentives for building owners and occupants. Buildings are lit up at night with facade lighting and outdoor advertising, which can be excessive and unnecessary. There is nobody to see and enjoy the lighting at night. To reduce unnecessary night lighting, the government could make it mandatory for building owners to reduce their outdoor lighting from 1 to 6am, and to have a limit on the maximum lighting watts or lumens per square metre. The government needs to be more ambitious and accelerate the adoption of solar energy. The current target is to increase solar deployment to 350 MWp or 5% of energy demand by 2020. It is also estimated that renewable energy could potentially contribute up to only 8% of Singapore’s peak electricity demand by 2030. However, the Solar Technology Roadmap initiated by NCCS and NRF, suggests that it is possible to have solar electricity contribute up to 30% of electricity demand in 2050, under strong energy efficiency efforts and for an accelerated scenario of full utilisation of effective area and accelerated growth in photovoltaic efficiency, yield, and cost reduction. The government could start exploring the feasibility or implementation of the accelerated scenario, which looks at full utilisation of the effective area that is available for PV installations in Singapore such as rooftops of HDB and other buildings, building facades, MRT tracks, surrounding islands, and floating PV systems. Besides these areas, it might also be possible to construct skyrise spaces between buildings and structures for solar installations and look beyond just the rooftop spaces. With increased (and competitive) use of rooftops of public and private buildings in Singapore for solar panels, rooftop greenery and urban farms, the government could develop a master plan on the usage of rooftops. The government has to consider whether to encourage more roof spaces on buildings for solar energy, rooftop greenery, or for growing food crops. If the priority is to allocate rooftops for solar energy, plans could be made to integrate the other activities below the solar panels if possible. The government can consider a mandatory framework on basic carbon footprint reporting and benchmarking for companies. This reporting framework should be simple and easy to adopt so that it does not add too much burden for companies. One such existing framework is the Greenhouse Gas (GHG) Protocol, developed by the World Resources Institute and the World Business Council on Sustainable Development, which sets the standard for how to measure, manage, and report greenhouse gas emissions. The government can consider adopting the GHG Protocol as the framework for a company to prepare a carbon inventory of its business operations for Scope 1 (direct GHG emissions) and Scope 2 (electricity indirect GHG emissions). With the carbon footprint data, companies can be benchmarked against their peers in the same industry. This would allow companies to understand how they are performing and motivate them to take more action to reduce their carbon footprint (and try to be the best or not to be the last). If the data is made available to the public or investors, it would also nudge the companies to increase their carbon reduction efforts. The adoption of the Paris Agreement is a historical step for the world to finally share responsibilities and focus our decarbonisation efforts to limit temperature increase to 1.5 °C. But all countries must act and at a faster pace in order to achieve that outcome, including Singapore. Our government must be bold and our companies must start now on their energy efficiency and climate change mitigation efforts. There is no turning back after the Paris Agreement and it’s full steam ahead for Singapore’s low carbon future.